It’s important for every company to showcase their products to their customers and it can prove essential not only to include images but also image galleries in their publications. This enables the customers to familiarise themselves more with the products and services the company offers. The audience can become more informed regarding the products and the need to call a support line is reduced. Showcasing your products to your customers gives them a greater understanding of your product’s quality and allows them to learn more about your company. Through the use of an image gallery, your products can be displayed through different angles, filters and more. If your product has many different features, an image gallery can be a great way to display all of these. An image gallery is a great way to market your products and services in eye-catching fashion. So why should you include an image gallery in your publication? As a company, confident in their products and services, an image gallery can be a great way to showcase excellence. Your customers can see the high-quality products and make decisions on purchasing there and then. For this reason, it’s vital that you use high quality images in your gallery, instantly grabbing the attention of your customers and resulting in direct product sales. Publications with a photo gallery are more likely to see their products sell faster than those without this feature. A great example of an industry where you can effectively make use of an image gallery in your publication is real estate. Through an image gallery feature, you can freely add properties that just became available to customers and remove any of those that are no longer on the market. If needs be, you edit the number of listings displayed on each page and separate your listings by locations, making them easy to access for your customers. Using an image an image gallery allows real estate companies to display their listings by location, prices, features and more. If you’re a real estate agency and you’re selling one of client’s properties, through an image gallery you can easily update the photos of that property if your clients send updates. Agencies can encourage their clients to send new photos of their houses the second they make any alterations. Another important benefit of using an image gallery is space. Real estate agencies would have to use a lot of publication space showing their properties without the use of an image gallery. This can result useful images being left out due to a lack of space. With 3D Issue flipbook software, you can add an image gallery to your publication. To do so, use the interactive dropdown in the design tab of the software and simply select the page you would like to add an image gallery to. 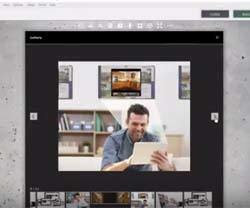 This feature enables you to present multiple images within one viewing pane to the end reader. You can also add several image galleries to the one publication and it’s up to you as to how you’d like to present them, as a button or a hotspot. Simply size and position the button or hotspot on the selected page, add your images, give the gallery a title and you’re done.